A field study on 76 farmer's field was conducted in three different villages of Jhunjhunu district of Rajasthan under Rashtriya Krishi Vikas Yojana (RKVY) project during rabi season 2009-10 with the objective to enhance the productivity level and net return of chickpea crop. Data reveals that two foliage application of mixed solution of thiourea (0.05%) and zinc sulphate (0.2%) agrochemicals at branching and pod formation stage has positive influence on chickpea seed yield and net returns. Highest seed yield (10.35 q/ha) achieved under T4 treatment followed by T3 treatment (10.25 q/ha) in comparison to other treatments. The B: C ratio was also highest under T4 treatment (1.42) as compared to control (1.34) and other treatments. Aldasoro, J.J; Matilla, A and Nicolas, G. (1981). Effect of ABA, fusicoccin and thiourea on germination and K+ and glucose uptake in chickpea seeds at different temperatures. Physiol. Plant.,53:139-145. Anitha, S., Purushothaman, S.M. and Sreenivasan, E. (2006). 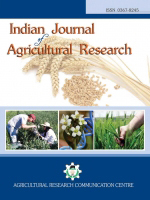 Response of Horse Gram to thiourea application under rainfed conditions. Legume Res. 29(2): 146-149. Farooq, M; Wahid, A; Kobayashi, N; Fujita, D and Basra, S.M.A. (2009). Plant droughts stress: effects, mechanisms and management. Agron. Sustain. Dev., 28: 185- 212. Garg , B.K., Burman,U.and Kathju, S.(2006).Influence of thiourea on photosynthesis, nitrogen metabolism and yield of clusterbean (cymopsis tetragonoloba) under rain fed conditions of Indian arid zone. Plant Growth Regulation. 48:237-245. Gupta, S., Kumar, S. and Chander, C. (2004). Dalhan utpadan mein atam nirbhar kaise bane.Unnat Krishi, 43(1): 10-13. Hazra, P. And Som, M.G. (1999). technology for vegetable production and improvement, Nayaprakash, 206, Bidhan Sarani, Calcutta, India pp.103-104. Sahu, M.P. and Singh, D. (1995). Role of thiourea in improving productivity of wheat (Triticum aestivum L.). J. Plant Growth Regulation 14:169:173. Yadav, V.P.S. and Kumar, R. (2007). Boosting pulse production through Front line demonstration- An innovative technology. Agric. Ext. Rev. .July-Dec.2007.P. 31-34.